André Le Duc has been promoted to Chief Resilience Officer and Associate Vice President (AVP). 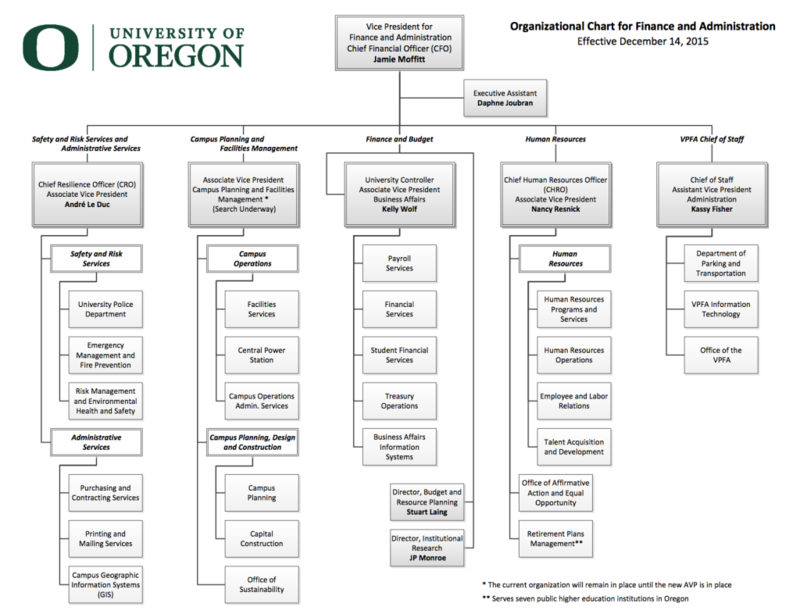 The UO Police Department has been added to his portfolio, rounding out the safety and risk services area, which continues to include the areas of Emergency Management and Continuity, Fire Prevention, Risk Management, and Environmental Health and Safety. André will also head up a new administrative services area, composed of Purchasing and Contracting Services, Printing and Mailing Services, and the Campus Geographic Information Systems (GIS) unit. Nancy Resnick, the University’s Chief Human Resources Officer, will have responsibility for an expanded portfolio. Going forward in addition to the Human Resources department, her portfolio will include the Office of Affirmative Action and Equal Opportunity, as well as the Retirement Plans Management unit, which administers the five retirement plans used by all former OUS institutions. As was announced in September, a search is underway for our new AVP for Campus Planning and Facilities Management to oversee the units currently comprising Campus Operations, Campus Planning, Design and Construction, and the Office of Sustainability. We look forward to visits in early January from our top candidates. Note that until the new AVP is in place, these units’ organizational structures will remain as-is. Kassy Fisher will now serve permanently as Chief of Staff, a role she took on temporarily in July. I will continue to directly oversee and work closely with our financial team, Kelly Wolf, University Controller and AVP of Business Affairs, and the directors of Budget and Resource Planning and Institutional Research. I am excited about what I believe is a leadership structure that fosters integration and builds upon the strengths of our team. Tagged Jamie Moffitt, Penny Daugherty, Public Safety. Bookmark the permalink. Andre Le Duc? That’s good news for a change. Really good news.